The "M-Torque Inspection" is our way to catch most bike-related problems before they happen on race day. You've trained for months for your key event. Careful planning and preparation has brought you to the starting line in the best shape of your life. Your transition area is organized with shoes that don't blister your feet, a hat that has molded to your head from hundreds of miles of running, your favorite helmet waits for you atop your triathlon bike. Your bike was recently tuned up by your favorite bike shop before you disassembled it to fit into a travel case. Everything is ready. They say triathlon is really 4 disciplines: swimming, biking, running, and nutrition. I'll make the argument that it's 5- with planning/logistics being the 5th. Competing in a triathlon can be a logistical nightmare: your balancing training, family, work, flights, hotel, car rentals, racing gear, nutrition, etc. All of this adds stress to an already stressful situation. It's not surprising that sometimes the most basic mistakes are made on race day- you're so busy covering the big ticket items that the small things slip through your fingers. 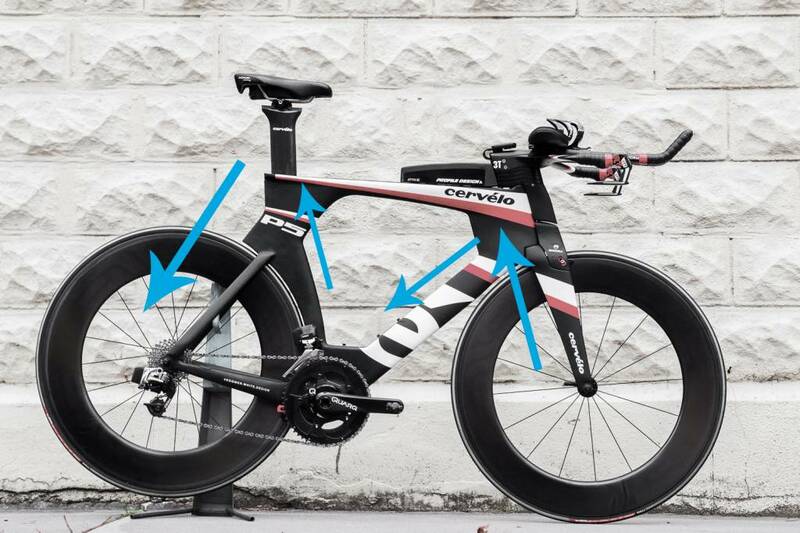 When it comes to small things the most common mistake we see are athletes forgetting to properly tighten the bolts on their bike before a race. This is especially important if you traveled to your race via plane. Here is a process our mechanics go through almost every time we touch a bike, virtually eliminating the race-day DNF due to loose bolts. It's called the "M-Torque Inspection". The M-Torque Inspection is a way to systematically check every item and bolt on your bike. You start at the front hub, work your way up the fork to the handlebar/cockpit area, down the downtube to the crank, up the seat tube to the seatpost/saddle, and finally down the seat stays to the rear hub. Essentially following a reverse "M" pattern. Using your multitool or torque wrench, check every single bolt you come across. Most triathlon bikes will have around ~40 bolts in total. With practice, our mechanics can do a full M-Torque inspection in less than 5 minutes. This process has saved thousands of mistakes from rolling out the door, and has helped our service bay maintain a reputation for mechanical excellence. The best part is that you don't have to be a professional mechanic to do this, you'll just need to follow the process with a couple tools. - Start at the hub and check the quick release. Is it snug? Is the wheel centered in the fork? - Moving up the fork: are the brake pad bolts tight? Are the brake mounting bolts tight? - Moving up to the handlebar/headset: are all the stem bolts tight? Are all aerobar bolts tight? Grab and gently try to rotate the shifters and brake levers... they should not move. Grab the fork with one hand, and the stem with another and gently try to rotate them forward and back- there should be no play in the headset. - Moving down the bike's down tube: check the water bottle cage bolts (and the top tube bento box if you have one). - Onto the crank area: Is the front derailleur mounting and cable pinch bolt tight? Are the chainring bolts tight? Are the crank bolts tight? - Moving up the seat tube to the saddle/seatpost area: Is the seatpost pinch bolt tight (be careful- snug is best or use a torque wrench)? Are the saddle mounting bolts tight? If you have a saddle hydration system check all mounting bolts on it, too. - Moving down the seat stays: check rear brake pad bolts and mounting bolts. Check the rear derailleur mounting bolts and cable pinch bolts. Finally, is the rear quick release snug? Is the rear wheel straight within the frame? 1. Are the brakes engaging properly and to your liking? 3. Do you hear any unusual sounds or feel anything unusual? And that's it. Expect this process can take anywhere from 10-30 minutes depending upon your experience. If you find an issue you may be able to take care of it yourself, or at least you caught the problem early and can take it to a qualified mechanic for help. We require our mechanics to go through this process every time they work on a bike. It takes more time, but we feel it's worth the piece of mind and helps maintain our commitment to quality. Start in the bikes absolute lowest gear (climbing gear), gently squeeze the brakes but continue pedaling, and check for excessive mechanical rubbing or sounds. It should be quiet. Shift down the rear cassette one gear at a time. The bike should hit each gear with confidence. Once you have fully cross chained (you may hear mechanical rubbing at this point), shift back up the cassette back to your climbing gears. Again, it should shift relatively quickly and with confidence. Now shift somewhere near the middle of the cassette and shift the front derailleur to the big ring. While pedaling shift the front derailleur relatively quickly up and down a few times. Shift the rear derailleur to a climbing gear and repeat the front derailleur shifts again. Now shift the rear derailleur to a hard gear and try the front shift again.